Yesterday Google hit a rather significant milestone in Android history. 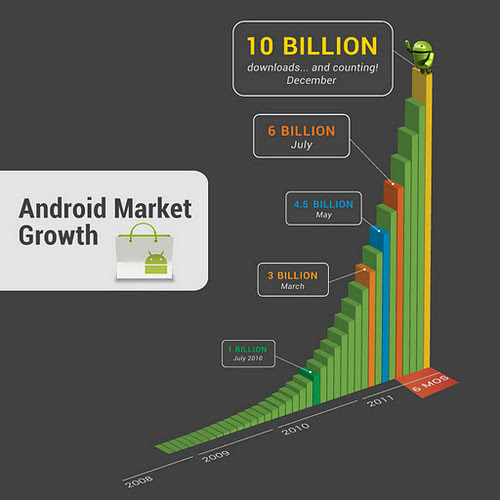 The Android Market surpassed the 10 billionth download mark and with ease. Now it hasn’t been a road of ease for the Market. I remember when it was a dark and dreary world with next to no search functionality back in ’08/’09. Now to see it maturing is something worth bringing a small tear to my eye. But be it known that the Market still has a ways to go. Back in July, the Market hit the 6 billion mark. So to have a jump of 5 billion downloads in the span of 5 months is pretty impressive. Google has indeed confirmed that there are 1 Billion app downloads per month. So now it’s time to celebrate. Google is now offering apps of their choosing at the fancy price of $0.10 for 10 days (which started yesterday.) So keep your eyes trained on the Android Market for goods that may be on sale. Next Next post: Day 2 of Android Market’s “10 Billion Promo”: What’s On Sale?